We tend to view copyright like a dragon (just go with it, it’s thematically apt). Frightening, yes, but sufficiently remote or arcane that it is unlikely to trouble most of us. But there will always be those with a thirst for adventure, a willingness to test their strength and cunning against the dragon: and we all rely on these noble souls who create or disseminate or facilitate access to copyrighted works. These people enter its lair and poke it with sticks. Sometimes the dragon behaves reasonably. Sometimes the dragon rises in wrath. Most often, however, the dragon speaks in riddles, sending its beguiled challengers away on a desperate quest through statute, case law, listservs, speculation. Much can depend on the conclusions drawn. So gather around, and hearken to a tale from the Elder Days, when confusion over copyright sparked an unexpected explosion in popular culture and “Frodo Lives” lapel badges. While copyright in Europe has embraced an international approach since the 1887 adoption of the Berne Convention, the United States followed its own distinct copyright framework until it joined the convention a century later. Derived from an original clause in the American Constitution, the American approach differed significantly in a number of ways, particularly in its emphasis on the observance of legal formalities to ensure copyright protection. When a work was originally published abroad but subsequently in the United States, meeting the demands of American law were essential to ensure that the work remained protected by copyright there. Originally published in the U.K., J.R.R. Tolkien’s The Lord of the Rings was one such book. Everyone has now heard of J.R.R. Tolkien and The Lord of the Rings. They are well-established features in the international pop culture landscape. But how did this occur, and why, particularly, has the American public especially embraced the book? A surprising fact is the extent to which uncertainties surrounding copyright — what Tolkien’s biographer Humphrey Carpenter termed “the confused state of American copyright law at that time” — were central to this unlikely process. Allen & Unwin first published The Lord of the Rings in the U.K. between July 1954 and October 1955, splitting the prodigiously long work into three volumes. (Tolkien maintained that the book was a single narrative, and hence not a “trilogy”). This division was pragmatic: multiple publication dates increased the number of reviews that might be expected, reduced the initial cost of production, but also potentially allowed cancellation of the project should the first volume sell disastrously. Eventually, however, this initial caution contributed to the unexpected events that ensued a decade later. 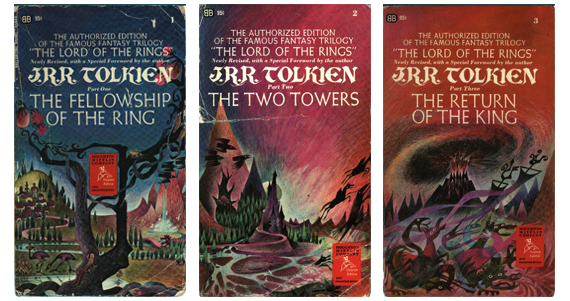 For the American market, meanwhile, Allen & Unwin arranged with the Boston firm Houghton Mifflin to publish The Lord of the Rings in the United States. Because it, like Allen & Unwin, did not anticipate blockbuster sales, Houghton Mifflin opted not to set and print the book itself, instead importing sets of unbound sheets printed by Allen & Unwin in Britain, inserting its own title leaves, and then binding the books. This was not an unusual arrangement. In his standard guide to the publishing industry, Sir Stanley Unwin of Allen & Unwin noted, “The importation of ‘editions,’ whether forming part of the English edition or separately printed, is the method adopted by American publishers in cases where a large sale is improbable.” However, this method of publication significantly affected the copyright protection available to a text in the U.S. The existence of ad interim copyright, a second class category of copyright protection. Ad interim copyright persisted for five years, and applied to an edition of no more than 1,500 (imported) copies of a text. In order to preserve copyright for the full term allowed by American law (a renewable 28 years under the statute in effect at the time), the American publisher was required to print the book itself before ad interim protection expired, thus satisfying the protectionist “manufacturing clause” in American legislation that required that every stage of type-setting, printing and binding had to occur within the U.S. It violated the terms of ad interim copyright. Houghton Mifflin pretty certainly imported more than 1,500 copies of each volume before printing the book itself at its own Riverside Press in the U.S., and it did not begin printing the book until 1963 or 1964, more than five years after initial publication and hence after the five year window granted by ad interim copyright protection had elapsed. There was a time when the Hobbit fantasies of Professor Tolkien were being taken very seriously indeed by a great many distinguished literary figures … I had the sense that one side or other must be mad, for it seemed to me that these books were dull, ill-written, whimsical and childish. And for me this had a reassuring outcome, for … today those books have passed into a merciful oblivion. Not everyone held this opinion, however. 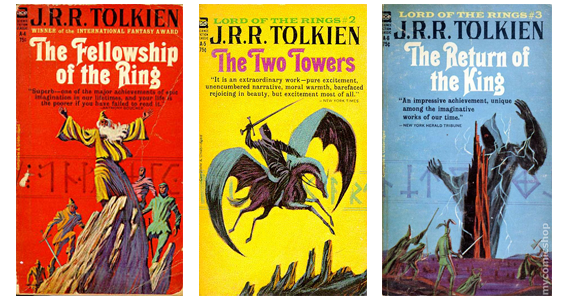 Donald A. Wollheim, of American science fiction paperback publisher Ace Books, noticed the questionable copyright status of the book, and persuaded his employer to publish the first paperback edition of The Lord of the Rings without contacting Tolkien or his publishers. Ace produced 150,000 copies of each volume during Spring and Summer of 1965. And where the hardback at that time sold for US$5.95 per volume, the Ace edition did not pay royalties to Tolkien or to his publishers and cost only US$.75, quickly becoming became “the hottest-selling item in U.S. campus bookstores.” (Saturday Evening Post, 1 July 1966). This notice continued to feature prominently on Ballantine copies throughout the 1960s and 70s, until long after the Ace edition had disappeared from bookshops, and indeed until after Tolkien remained “living”. Meanwhile, Tolkien’s authorized publishers aggressively notified the book trade of their position. Very quickly, Ace attracted such bad publicity that the Ballantine edition began to win in the marketplace, and Ace agreed both to pay “full royalties” to Tolkien and not to reprint. Contrary to frequent assertions otherwise, the resolution of this conflict did not involve legal action at the time. Rayner Unwin, of Allen & Unwin, later recalled that “Houghton Mifflin were not confident that they could enjoin Ace Books for breach of copyright, and from our general understanding of this complicated and untested branch of American law we agreed.” (In fact, American courts only established the copyright status of The Lord of the Rings conclusively in 1992 [Eisen, Durwood & Co. v. Christopher R. Tolkien] when the United States District Court for the Southern District of New York ruled that forfeiture of copyright did not result from failure of foreign works to carry copyright “notice,” and that because the U.S. eventually joined the Universal Copyright Convention during the period The Lord of the Rings was still protected by ad interim copyright, the book retroactively gained full American copyright.) But Ace’s impudent willingness to test the legalities ultimately benefited both Tolkien and his authorised publishers — and the reading public — to a spectacular degree. The conflict influenced the subsequent history of The Lord of the Rings fundamentally. It is possible that, without the impetus provided by the intervention of Ace, The Lord of the Rings would never have appeared as a mass market paperback. (In one of his letters, Tolkien appears to consider paperback books as “cheap;” Wollheim publicly argued that “if Ace Books had not published these works in soft covers … there would not now or ever have been any other low-priced editions.”) And significantly, the controversy focused attention on the book in an extraordinary way. Unusually, the conflict left the book pages of the newspapers and became news in earnest. The book had already been in print for ten years by 1965; the simple event of its publication in wraps would never have generated the same level of attention. And suddenly, an unexpected — and unexpectedly vast — audience for The Lord of the Rings appeared. Whereas the book had sold an estimated 15,000 (hardback) copies in the U.S. before 1965, something like a quarter of a million paperback copies were sold in ten months, primarily to young people. For the rest of the 1960s, the American media commented on the Tolkien “fad” and then “cult” among the young, with titles such as “Wacky world of Tolkien catching on with youth” (L.A. Times, 31 Aug. 1966). As one indulgent mother who bought “this year’s ‘In’ book… for her freshman daughter” put it, “‘Going to college without Tolkien is like going without sneakers.’” (Time, 15 July 1966). Sixty plus years have now passed since initial publication of The Lord of the Rings, and fifty since the transformative period of the mid-1960s. The book has never left print, and has sold millions of copies in dozens of languages. The longevity of the book can no longer reasonably be doubted. But who would have thought that ambiguities enveloping copyright would prove central to this fact? It is of course impossible to state unequivocally that The Lord of the Rings would never have attained such massive popularity had Ace Books not gambled that the book had inadvertently slipped into the public domain. In the event, however, Ace Books did provoke the dragon, and this feat of daring indelibly influenced popular culture. This post is based on research published in Book History 8 (2005): https://doi.org/10.1353/bh.2005.0011.